Policy in Practice analysis on the Summer Budget finds that many low earning households will be worse off in 2020. New analysis from Policy in Practice looks at the combined impact of measures in the budget, and finds that many low earning households will be worse off in 2020. 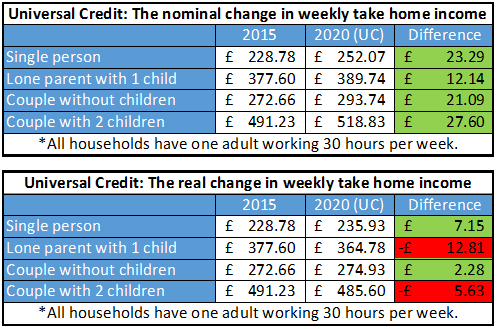 A lone parent with one child working 30 hours a week will be worse off by £2.33 per week in 2020, in nominal terms, and £26.36 per week in real terms, or £1,370 per year. Under Universal Credit, the picture is a little better. But many households unable to work 35 hours will still lose out in real terms. “For the lowest earning households, this budget offers a lot of ‘stick’, but leaves the ‘carrot’ dangling some way off into the distance. “Employers are being asked to pick up the tab, while a higher effective tax rate takes more from every extra pound an employee earns, and gives it straight to the government to lower the Tax Credit bill. “Making Universal Credit look good by cutting tax credits is not the right way to go about things. “The government needs to invest in work incentives within the welfare system. We know that this is more cost-effective than tax cuts at supporting people into work, will help them to progress in work and will tackle poverty in a sustainable way. George Osborne announced £12bn of cuts to welfare in the Summer Budget 2015. £5.5bn of these will fall to tax credit and Universal Credit recipients. £3.8bn of these savings will directly affect the work incentives of low earning households. The Chancellor also announced an increase in the personal allowance, and an increase in the minimum wage for people over 25, from £6.50 today to £9.00 by 2020. Policy in Practice was founded to ensure that public policy works for people on the frontline. The founder, Deven Ghelani was a core part of the team that developed Universal Credit at the Centre for Social Justice. The analysis in this release is based on the Universal Benefit Calculator, software developed by Policy in Practice to make the welfare system simple for people to understand. Additional analysis can be carried out for media organisations upon request.